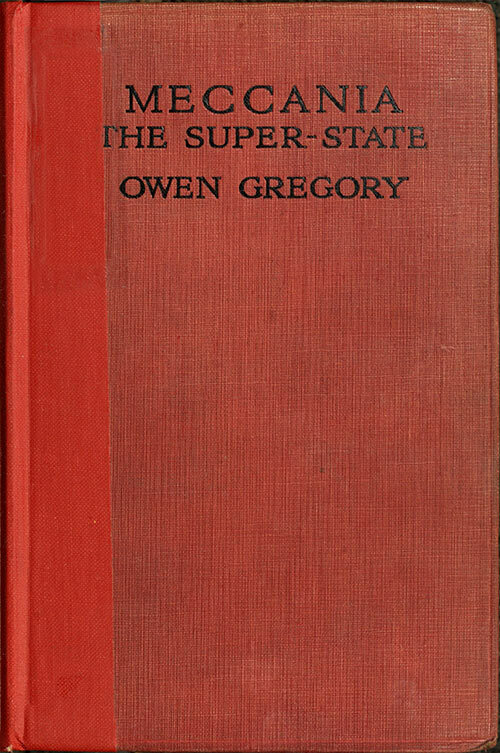 Before George Orwell’s classic dystopian novel of life in the totalitarian country of Oceania, there was a similar book written by, Owen Gregory titled Meccania the Super-State published in 1918. Gregory, like Orwell, was concerned about the growth of authoritarian governments in Europe with the consequent loss of freedom during and after the First World War. While Orwell took the contemporary rule of Stalin as his model for Big Brother’s tyranny, Gregory projected the authoritarianism and militarism of Prussia and Germany to what he saw as a logical extreme. By doing, Gregory was able to predict, with astonishing accuracy, many of the features of the twentieth century totalitarian state, which Orwell could observe. Meccania is set in the year 1970 and is a first person account of the visit of a Chinese man, Ming Yuen-hway, to Meccania, a thinly disguised Germany. After visiting Luniland (Britain) and Francaria (France), Ming decides to make a trip to Meccania to see if the stories about the country are true. His difficulties in getting into Meccania and travelling about the country would be familiar to anyone who has tried to visit Nazi Germany or Soviet Russia. It is not easy to arrange to get into Meccania and once inside, Ming is accompanied by conductors. He is not permitted to speak to Meccanians without permission and must follow a prearranged tour. He learns that he will not be permitted to take his diary out of the country, especially since much of it is written in Chinese. In Meccania, Ming discovers a country in which everything and everyone are precisely and efficiently organized. The people are divided into seven classes, from unskilled labor, to skilled labor, artisans, professionals, businessmen, to the military and noble classes at the top. No one is free in Meccania. Everyone eats the food, wears the clothing, works the job, and even attends plays and concerts prescribed for him by the state. There is no private life; the state even requires its subjects, and foreign visitors like Ming, to fill out diaries account for their location and activities throughout the day. No one reads for enjoyment. Every book and children’s toy is educational. This system began to be put into place by the great Prince Bludiron (Bismark) in an attempt to counter the influence of Spotts (Marx) among the working class. After Meccania’s defeat in World War I, it appeared that all of Bludiron’s work would be dismantled and Meccania would become democratic. Fortunately, Prince Mechow came into power and refined and extended Bludiron’s policies until Meccania became the Superstate. The Meccanians profess to believe that this system is superior to all others and look forward to the day when the whole world is ruled by a superstate. Owen Gregory displayed a good deal of prescience in this book, at least in so far as the way in which totalitarian states attempt to impress foreigners. There is much that Ming is not allowed to see, but he is a perceptive observer and is able to deduce much that the Meccanians don’t want him to know. Gregory’s predictions are not perfect, however, though when he errs it is usually in underestimating the viciousness of such regimes. He wrote before the Holocaust or the Gulag, so perhaps that is expected. Dissidents in Meccania are not shot or sent to concentration camps. Instead, Meccanian psychiatrists claim to have discovered a mental illness, “chronic tendency to dissent”. Dissenters are placed into mental hospitals until they recover (recant). This is, in itself a remarkable forecast of Soviet psychiatric methods, but Gregory is apparently unable to imagine that a superstate dedicated to efficiency would be so irrational as to seek to eliminate sections of its own population for political reasons. This Meccanian efficiency is Gregory’s greatest blind spot. He, through Ming, laments the loss of freedom of the Meccanian people and fears that other states might be forced to adopt Meccanian methods in order to compete with Meccania’s military and economic power. If the adoption of a totalitarian superstate really resulted in an increase of industrial and military efficiency, such that the standard of living of even the poorest was improved, then it might be worth the bargain. As it is, the results of command economies, such as the Soviet Union show that a superstate would be anything but efficient. No planners, however sophisticated can easily anticipate the needs of a modern economy and no citizen, however docile, will work as hard doing what the state requires as he would doing what he wants. Overall, Meccania is a surprisingly enjoyable book to read, better than most dystopias, including 1984. It is a more pleasant book, since the main character is a visitor to the dystopian state not a subject trapped in it. It might is still a timely warning. Communism, Fascism, and other totalitarian systems may have been discredited, except on American college campuses, but the desire to create a super state, for our own good, is still very much in evidence among the do-gooders, the nanny statists, the Bloombergs, and they still bear watching. 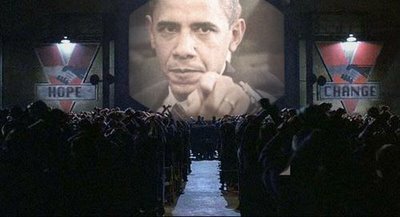 With all of the news coming out about how the US government has been spying on its own citizens, maybe George Orwell should have titled his book 2013 and set it in America. We do seem to be steadily getting closer to the sort of country where Big Brother is watching us, for our own protection, of course. Just looking at the headlines at the Drudge Report, we have the NSA tapping into the user information of Apple, Google, Yahoo, Microsoft, Facebook and others, the Post Office has been photographing mail, the NSA has been intercepting Americans phone calls and e-mail, and who knows what else. It is as if every idiotic conspiracy theory put forward by the tinfoil hat wearers is turning out to be true. Of course, it is easy to go overboard over all of this. 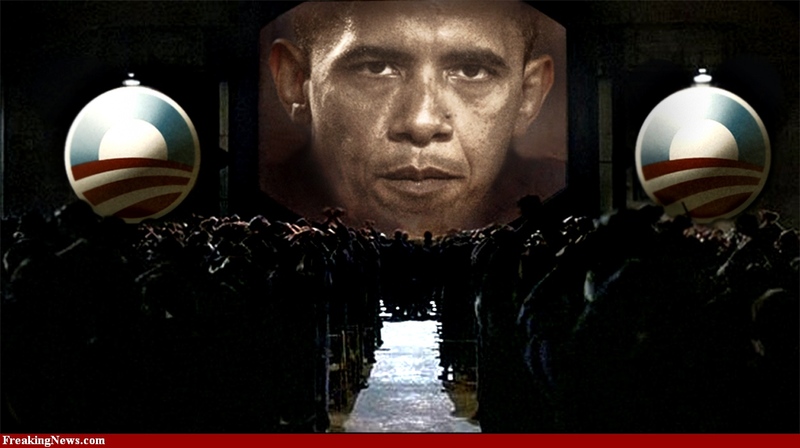 So far, there has been no indication that the government is actually spying on innocent citizens, at least not yet. The programs that have been uncovered do have a legitimate purpose. By having computers sift through billions of pieces of information, intelligence specialists can uncover terrorist plots, sometimes before they are even planned. We like to think that we have free will and we decide our actions, and we do, but our decisions are predictable if you have enough information. Any one working in sales or marketing already knows this. What the government is doing is simply taking the sort of data collection that advertisers do a further step. The question is though, do we really trust the government with so much information? Can we rely on the people in our government to work for our protection and not use this information for partisan advantage? As the revelations about the IRS’s selective enforcement of the laws against the TEA Party might suggest, perhaps we should not trust them. Meanwhile, It wouldn’t hurt to remind everyone that what you do on the Internet is never really private. Take it for granted that anything you post on Facebook, tweet on Twitter, or send in an e-mail can become public knowledge. Oh, and not to be paranoid, but you may want to cover up that webcam that came with your laptop. They could be watching you.